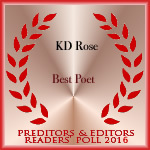 My new website is LIVE at http://authorkdrose.com. Check it out! My hope is, as much as health allows, to promote the best in art, music, opinion, essay, etc that I can find out there. I also have a few books for sale.